A senior partner at a north-east law firm is to step down, handing his role over to his daughter. Iain Considine, who founded Aberdein and Considine with Harvey Aberdein in 1981, will step back from his current position in charge of the firm’s Stonehaven branch in October, but will continue to support clients as a consultant. 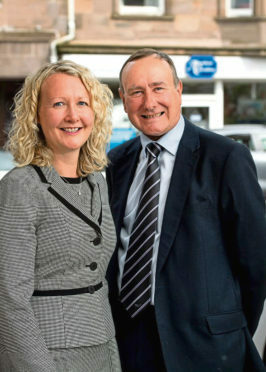 Mr Considine has been providing legal services to the local community for more than 20 years but as the time comes to wind down he will hand over the reins to his daughter Laura Considine who will become the partner responsible for Stonehaven. Last night she said she was determined to do all she can to continue building his legacy. Aberdein and Considine is now Scotland’s largest solicitor and lettings agent, with 20 offices and around 450 staff. Mr Considine began his law career with Edmonds & Ledingham having qualified in 1975, working with them as an assistant before joining Roy Grant & Co. Having known Harvey Aberdein for a number of years the two decided to launch their own firm, with an approach that they claimed put clients at the very heart of the business. Ms Considine, who joined the firm in 2005 after completing her traineeship with Dundas & Wilson, was born in Aberdeen and grew up in Banchory. She worked at the company’s Banchory and Aboyne offices before moving to Perth in 2007 to help establish what was a new operation. After spending 10 years in Perth she returned to the north-east at the end of last year. Speaking about his departure Mr Considine said: “It’s been a huge honour to have been part of the Aberdein Considine story from the start, and a real privilege to have worked with so many great people over the last 37 years. “At the time we had no idea that the firm would grow into what it is today, but it’s clear it’s in great hands and I’ll still be very much involved with clients and doing my bit to help.